Fasi offers a range of weigh scale blenders designed to meet the needs of the plastics processing industry. Depending on the model, up to ten materials can be blended. Throughputs range from 35 to 2500 kg/hr. 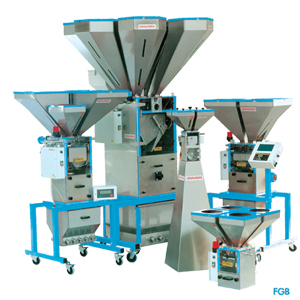 FGB-series are designed for accurate dosing, weighing and blending of free-flowing thermoplastic materials. The FGB is suited for use on extrusion and blow-moulding machines and as central-blender for several processing machines where consistency and high quality of the finished product is required. Because of the modular construction there are different models available in this series for the dosing and blending of 2 up to 10 components; generally virgin, regrind, masterbatch and various other additives. Besides installation on a support frame over the processing machine, the blenders can also be placed on a stand with integrated vacuum take-off box next to the machine or on a mezzanine floor above the machine. Components are dosed individually using pneumatically operated slide valves or have a combination with one or two electrically operated screw feeders. Each component is dispensed directly into the weigh-pan which is supported by a high precision loadcell system. When all the components are correctly weighed, the complete batch is discharged into the mixing chamber. An efficient horizontal mixer provides an uniform blend. A level sensor in the mixing chamber controls the total dosing cycle. * Capacity depends on number of components.